When it comes to pay, seniority and career progress, architecture’s gender gap is concerning, but how do we close the gap? Kathlyn Loseby from Crone Architects examines the issues. Gender equality and diversity has long been a topic of contention across all industries and recently it has been inspiring to see strong women speaking out and taking action to close the gap. Within the architectural profession it is encouraging to see the rising number of women not only working in the field but also becoming registered architects at an early age. I still wonder, with roughly 50 per cent of all architecture graduates being female, why does the gap still remain? Research by Dezeen found that women occupy 10 per cent of the highest-ranking jobs at the world’s leading architecture firms, while 16 of these firms don’t have any women in senior positions. This is concerning. The value of having strong representation of women in the architecture industry has been clear for a long time. Research from the Anita Borg Institute shows that employing more women into an organisation can lead to improved operational and financial performance, increased innovation, greater problem-solving and a heightened company reputation. Women can also bring a much-needed fresh perspective to the industry. At Crone we have many incredible women who have contributed so much to the overall success of the business, from the design and delivery of projects to the culture and social side. Women are often faced with many issues and speed bumps within their professional career, however, so changes must be made to ensure we are supporting them along the way. One of the biggest challenges women face in career progression across all industries is the career break when taking maternity leave. Returning to the workplace can be daunting when there are new practices in place and expectations remain unchanged. It is particularly difficult in the architecture industry where long working hours have been the norm. The introduction of flexible working options has greatly improved work-life balance. At Crone, we support working mums and want their transition back to work to be as seamless as possible. As a working mum, I have experienced this first-hand and have found that companies who encourage and accept flexible working hours are key to helping women balance work life and parenting. There are a few simple but effective processes we have implemented at Crone to help women transition back into the workforce. These include an on-boarding system, similar to the induction process for a new employee, which explains all of the changes that have occurred within the office and the industry while the employee was on maternity leave. For example, this may include updates in technical programs, practice management systems, even the way timesheets are completed. Collectively, these seemingly minor changes can be daunting. It’s surprising how much a business can change in a 12-month period. Another strategy is to provide monthly updates to the employee during their leave period so that they stay abreast of client, office and industry changes. Crone employs the Government’s ‘Keeping in Touch’ (KIT) program, which encourages employees on parental leave to stay connected with their workplace to help aid their transition back to work. Employees at Crone can access up to 10 KIT days which entitles them to payment at their normal rate. KIT days might include Skype calls with the team to receive updates on changes in the company and projects, email correspondence or face-to-face meetings in the office. We take our legal obligations seriously at Crone. For instance, all employees on parental leave have the right to return to the same or equivalent role and receive the same rate of pay and conditions prior to them taking parental leave. Flexible work arrangements are also offered and arranged on a case-by-case basis. The primary carer is entitled to 12 weeks paid parental leave after 12 months of service. The secondary carer is entitled to two weeks paid leave. Both are also entitled to flexible work arrangements for the first few weeks following the birth of the child. When employees advise of their pregnancy, Crone also offers to provide further support such as additional paid leave so as to attend medical appointments – five days for the mother and three days for the secondary carer. The company also offers mothers, on a case-by-case basis, the option to reduce their hours, change to lighter duties, rotate tasks or take additional breaks throughout the day to ensure high OH&S standards are maintained within the office. Regarding the lower percentage of women in senior leadership roles, the figures show the industry is lagging behind at a global level. At Crone we look to promote and hire people based on their expertise and skill, not gender. When looking to secure new talent for senior roles, however, there is a distinct lack of suitable female candidates. A study by Parlour found women comprised only 21 per cent of registered architects [now 25%]. The same report showed that just 14 per cent of Institute members who were practice partners were women, despite almost half the total number of university graduates being women. This is likely due to the structure of the industry, which unfortunately is not conducive to women requiring flexible work arrangements. You could also argue that men are regularly offered more opportunities than women. It comes back to supporting women throughout their entire career to enable them to reach the senior leadership roles and, in turn, implement processes to create positive change in the company while supporting their female colleagues. Another important factor playing into the success that women have to be appointed in leadership roles is their focus on becoming a registered architect early in their career. Through the registration process, architects are required to learn and experience all of the competencies required to become a dedicated and diligent project leader, thereby setting them up for career progression. I am really pleased to see a conscious move within the architecture industry in Australia to create gender equality. The Australian Institute of Architects (AIA) is spearheading gender parity in the architecture profession with the Male Champions of Change program. The program involves males in positions of power and influence within the architecture field forming a high-profile coalition tasked to create positive change with gender equality issues in the industry. This strategy focuses on males, as gender inequality does not only affect women; rather, it is an economic and social problem. The program aims to redefine men’s role to take action on gender inequality. It supports them to stand beside their female counterparts to disrupt the status quo. The Champions of Change has been active now for three years and follows on from the profound efforts of the AIA’s Gender Equality Taskforce and, of course, by Parlour. Crone is proud to be one of the founding members of the Champions of Change and in our practice we are committed to the 40:40:20 campaign: 40 per cent women, 40 per cent men, and 20 per cent discretionary employees. At Crone, the program has assisted us to provide a framework to support women within the practice and to create opportunities for them to flourish. As we move forward, culturally the view of men and women working alongside each other as equals is becoming the new normal, increasingly providing women with equal opportunities across all industries. As we work to close the gap on a historically male-dominated industry, we are experiencing an exciting time for women in architecture. Any and all ambitious female architects are welcome here at Crone. 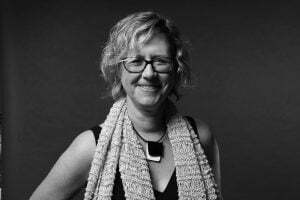 Kathlyn Loseby is the Chief Operating Officer for Crone Architects and a NSW Chapter Councillor of the Australian Institute of Architects. She has more than 20 years’ experience working at some of the world’s most prestigious architecture practices both in Sydney and London, and has taught Master of Architecture Students at UNSW.